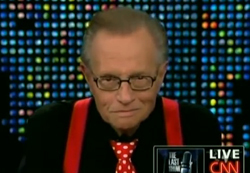 The last episode of “Larry King Live” was watched by an estimated 2.24 million viewers, beating Fox News and MSNBC in its time slot. 530,000 of those were in the coveted A25-54 demographic. That’s an 100% increase in viewership from the night before, when King interviewed Barbra Streisand for the hour. By comparison, Fox News’ “Hannity” drew 2.162 million viewers, with 543,000 in the demo. MSNBC’s “Rachel Maddow Show” drew 874,000 viewers, with 252,000 in the demo.